Despite the blue sky and bright sun blazing cheerily overhead, the Pender County Emergency Operations Center in Burgaw, North Carolina, was abuzz with activity and urgency on October 14. A crowd of uniformed workers bustled around the site, many of them preparing to go door-to-door and urge residents of nearby Rocky Point to evacuate the area and avoid the imminent floodwaters. By that Friday, six days had passed since Hurricane Matthew barreled into North Carolina, hovered over the eastern edge of the state and slipped out to sea. While the storm degraded to a Category 1 hurricane before reaching the state, it dumped up to 18 inches of rain on eastern North Carolina, a region already sodden from an exceedingly rainy September. Matthew’s torrential rains inundated streams and rivers, amassing floodwaters that crested to record heights before creeping ominously toward the coast. Although unified in their mission, the emergency responders sported vastly different uniforms, boasting a wide array of colors, logos and titles. Some wore gray Pender EMS & Fire T-shirts and bulky radios clipped to their belts. 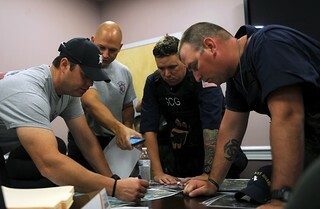 A handful wore black polo shirts with the Pender County Emergency Management logo emblazoned on the chest. Others wore unmistakable Coast Guard blue, bedecked in unusual combinations of operational dress uniforms, coveralls, bulletproof vests, waders and rubber boots. 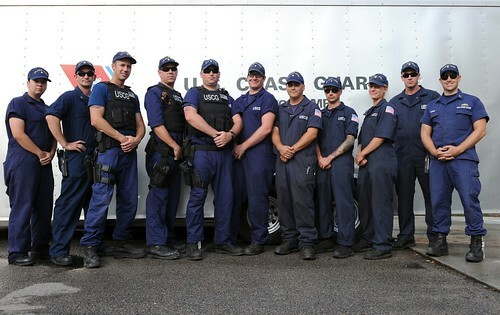 The Coast Guardsmen dispersed around the EOC were part of a team as unconventional as their gear: the Western River Flood Punt Team from Coast Guard Sector Lower Mississippi River in Memphis, Tennessee. 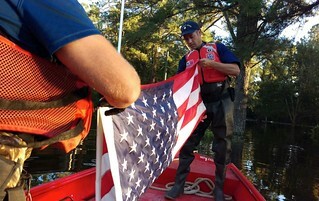 True said that when noteployed, the team conducts law enforcement and search and rescue missions along the Mississippi River and surrounding tributaries and lakes. 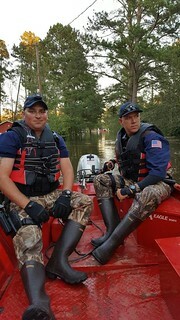 With only eight permanent members to operate the team’s six 16-foot flood punt boats, the WRFPT routinely requests volunteers from other Coast Guard units to augment their workforce. Two such volunteers on the team are Petty Officer 2nd Class Justin Van Dusen, a boatswain’s mate with the enforcement division at Sector Upper Mississippi River in St. Louis, and Fireman Daphne Bistrimovich, a crew member of Aids to Navigation Team (ANT) Colfax, Louisiana. Upon reporting to the punt team, volunteers received training on operating and maintaining the flood punt boats, then found themselves tackling skills not typically found on a Coast Guard boat crew member’s résumé. Bistrimovich, True and Van Dusen all agreed that the toughest challenge the punt team encounters is the unpredictable nature of the missions. After the storm passed, the WRFPT traversed eastern North Carolina, moving from Kinston to Fair Bluff to Rocky Point. The team embarked on a total of 23 missions, performed eight rescues and conducted more than 280 wellness checks. Beyond the numbers, True and Van Dusen described a quieter moment they said was just as fulfilling as rescuing people stranded by the rising floodwaters. The boatswain’s mates recounted patrolling a flooded Fair Bluff neighborhood and finding an American flag hanging off a resident’s flagpole. The punt crew decided to stop, take down the flag, then properly fold and place it on an air conditioning unit safely above the waterline. Bistrimovich said performing wellness checks might not be as dramatic an experience as pulling people from rooftops, but looking after their health and well-being can be just as instrumental in keeping them safe. Both True and Van Dusen agreed that the punt team could not successfully complete such a wide variety of tasks without the help of local entities. On that Friday morning, Coast Guardsmen on the punt team and members of Pender EMS & Fire quickly divided into smaller groups before commencing their wellness checks in Rocky Point, tackling the assignment in mixed-agency teams. After over three hours of canvassing neighborhoods and warning locals of the approaching floodwaters, the teams converged back at the EOC, arriving just in time for a surprise visit by Capt. Patty Hill, commander, Coast Guard Sector North Carolina in Wilmington, North Carolina. No matter the color of their uniform or the type of gear they carried, each emergency responder received words of praise from Hill and command coins as tokens of appreciation and recognition from the captain and other community leaders. Hill also presented command coins to Pender County emergency managers, acknowledging and thanking them for facilitating and supporting the Coast Guard’s missions during and after Hurricane Matthew.